High Spice Pizza Sauce is a fully prepared pizza sauce loaded with cheese, a tasty blend of herbs and spices, black pepper, salt, olive and soybean oil. It is prepared from round and or pear tomatoes that have been washed and hand sorted for quality prior to crushing. The product is hot filled to ensure commercial sterility then cooled before stacking. 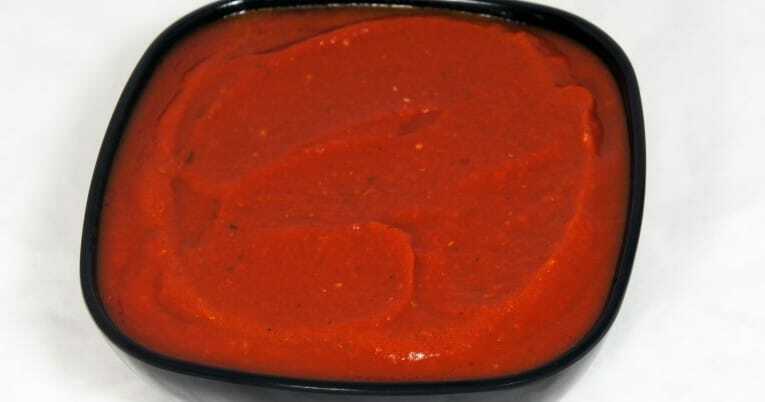 High Spice pizza sauce has a coarse finish and may contain seed particles and an occasional whole seed. It has a bright red color visibly awash with herbs and spices. Vine Ripened Crushed Tomatoes, Salt, Soybean Oil, Olive Oil, Romano Cheese (Whey Powder and Cows Milk), Spices, Garlic Powder, Citric Acid. Made from fresh California, vine ripened tomatoes. Fully prepared and ready to use. Romano Cheese added for unique flavor. Sweet, spicy blended flavor.